This model has the option of glider or electric and has a 2 piece wing for easier storage and carriage, and a large fuselage with a canopy type hatch. This fuselage offers plenty of room for servos, receivers and batteries and the chance to install a motor and a good sized battery pack if required. The 2 piece wings are made with glass fibre with a carbon spar and reinforcements. 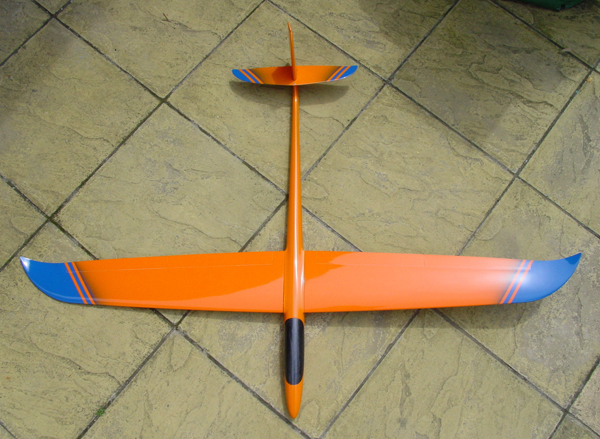 The fuselage is made with glass fibre also with carbon reinforcements and will take most outrunner brushless motors in the 350 to 800 Watt class and up to 4S Lipo pack batteries. A good motor is the hacker A30-12XL with a hacker speed controller 70A and a lipo battery 2200 4s 30C.The folding propeller is a Graupner cam prop 13x8. The fuselage has a cruciform tail with rudder and an all moving stabiliser.. The model needs 6 servos, 4 for the wings and 2 for the tail.